Ms. Ruffman was referring to the Temperance and Temptation Tours, currently running as a joint production of the Central Countries Tourism (CCT), and the provincial Ministry of Tourism, Sport and Culture. The tours are featuring the fun and facts of the province's drinking history in the Headwaters area and York and Durham Regions. She told us, “The cast is without equal. Braden [Wright] is fantastic as the Temperance Officer, Barnabas Bailey. We were a hurtling cast, mobile to get in front of the visitors in their bus...” as they travelled from venue to venue and get into position. The others in the cast are Michael Miranda as the bootlegger, Mickey Byrnes; Chris Wilson, band leader, playing and acting as saxophonist, Cab Caboodle (aka Dickey Byrnes); Chris Wilson also did the research for the tours. There are as well, Max Kelly, the band's banjoist, Nicky Byrnes; Jesse Corrigan on guitar and piano, as Ricky Byrnes. The tours are escorted by bus, with all the food and drink included, as is the overnight accommodation in first class hotels. Essentially, what combined to get them all to this point in the candy shop was an idea sparked by CCT's Executive Director, Chuck Thibeault. From there, the research was done by researcher and interpretive planner, Chris Wilson, who was hired by CCT. For the Headwaters Tours, naturally, the newly re-named Museum of Dufferin (MoD), formerly the Dufferin County Museum and Archives, was completely on board with the idea and was a major partner in developing the Headwaters story. The museum contributes further during the run of the tours with a showing of its own: Temperance and Temptation, the Exhibition. There are other fine establishments to see, like the Terra Nova Public House, the Adamo Winery and the Spirit Tree Estate Cidery. She continued by saying, “The music is fabulous. They play a lot of different instruments – banjo, guitar, base, piano, accordion and the drums. Sometimes, I play the drums too. The songs are all from the era. The songs, which were written at the time, follow such themes as about a daughter dying and people doing terrible things; some of them are rather heavy tales. Still and all, Ms Ruffman, in one of her roles, as a Woman of Temperance, sings them with all the passion of that lady trying to lead the strayed folk back to the fold. It is a packed two-day tour, the cast and the band in constant attention, with their story, their changing roles and the band providing the music. To prepare for the tours, the actors only had two days to rehearse the script and one to visit all the venues, so they would have an idea of what they were doing and where it would all fit in, in each venue. The venues were also very creative with their food, keeping it to the theme but always excellent. Seven tours are still left to run: two in Headwaters, two in Durham and three in York. 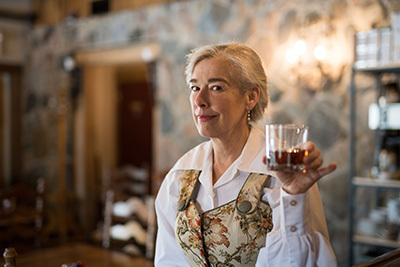 There is yet the chance to sample drinks you never heard of because they were in fashion nearly 100 years ago; taste wonderful meals, some possibly not in vogue for decades and enjoy the hilarious fun of Mag Ruffman, her cast and the Bootlegger Band.